Excellent base for Dorset/Coarse fishingNestling below the Wessex Ridgeway and close to the spectacular Dorset World Heritage Coastline between Bridport and Lyme Regis, The Gatehouse is part of an educational complex in Hooke near the quaint town of Beaminster, and is an excellent single storey detached holiday home to enjoy this popular area. 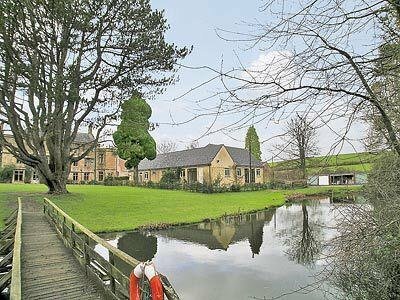 It offers four bedrooms, three shower rooms and 2 en-suite bath/shower rooms, (one disabled friendly), a living/dining room/kitchen and garden, and you can enjoy the extensive gardens around the moated Manor House and coarse fishing in the lake. The surrounding area is rich in heritage, there is glorious countryside and Chesil Beach to enjoy, walking, boating, fishing, and swimming, or visit Broadwindsor Craft Centre, Abbottsbury Swannery, Weymouth with its Timewalk and Sea Life Centre, and the pretty seaside resort of Lyme Regis with its famous Cobb, all of which will leave one with a memorable holiday. Shops, pubs and restaurants 3.5 miles.All on ground floor: Living/dining room/kitchen. 4 bedrooms: 2 double (5ft zip and link can be twin on request), both with French doors and en-suite bathroom with shower over bath and toilet, 2 twin. 3 shower rooms with toilet, one with bidet.Oil CH and elec inc (£30pw Dec-Jan). Bed linen and towels inc. T/cot. DVD. Stereo/CD. Elec cooker. M/wave. Washer/dryer. D/washer. Freezer. Enclosed lawned garden and furniture. Portable gas BBQ. Ample parking. No smoking. NB: There is a moat with deep water close to the property. Be the first one to tell us about your rental experience while staying at The Gatehouse. Let us know if the listing matched your expectations. You can share your comments about the location, property owner/manager and all the unique features that made your stay a memorable one.